At last, the College Football Playoff Championships! Some of the best football to be played all year and it's only the start of January! For this very special occasion, we teamed up with the good folks at Eckrich (the people behind the pregame $1 Million Challenge) to bring you a gut-warming, tasty recipe that'll win you compliments at your Championship Game homegating party. 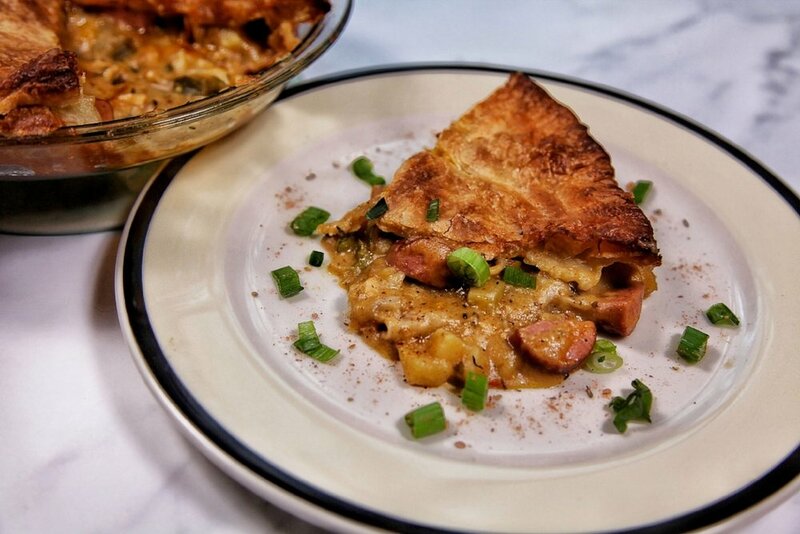 We took Eckrich's yummy Original Skinless Smoked Sausages and baked 'em into a zesty new take on good ol' pot pie. Enjoy! * To make 1 pot pie, divide all ingredients in half. Place potatoes in a medium-sized saucepan. Cover with with until the water level just clears the top of the spuds. Bring water to a boil, then reduce heat to a simmer and cook for 8-10 minutes, until fork tender. Cook smoked sausages according to the stove top directions on the packaging. Remove from stove top, let cool for 2-3 minutes, then cut into half moons (cut each sausage in half the long way, and then cut the halves horizontally). Place the butter into a large skillet over medium-high heat. Once melted, add in the onions and garlic. Cook for 2 - 3 minutes, until the onions are tender. Add into the skillet the flour and Cajun seasoning. Stir well into the butter until fully blended. Then gradually add in the milk and broth, stirring continuously. Increase the heat to high and bring the mixture to a boil for about 2 minutes or until it thickens. Reduce heat to low. Add into the now-thickened mixture the jalapeño, green onions, bell peppers and sausage pieces. Stir in well. Remove from heat. Bake for 35 to 40 minutes on a low rack in the oven, or until the top of the pie is lightly browned. Let sit for 10 minutes before serving. Enjoy! ** You can use the leftover pie pastry for other dishes or decoration. Or, depending on how much extra pie pastry there is, you could have enough to use as a layer for this recipe. To do so, ball up all scraps together, then roll out on a floured flat surface as you might bread dough.